Jazeman Jaafar, with team mates Weiron Tan and Nabil Jeffri, finished fourth in the China round of the World Endurance Championship, in a rain-soaked race that tested the drivers and the cars to the limit. The trio of Malaysian drivers supported by Sepang International Circuit had a strong weekend, with second in class on the grid and are still in the thick of the hunt for title honours. 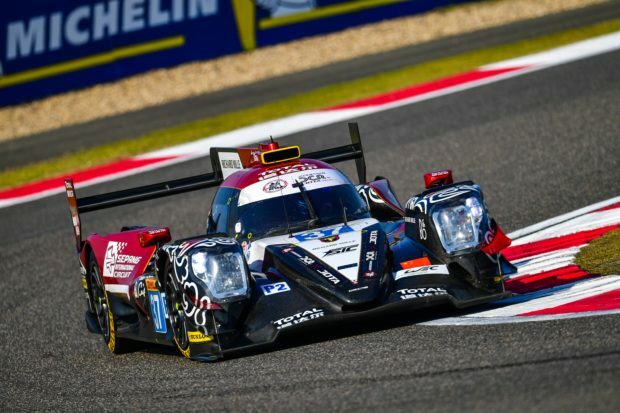 The Shanghai International Circuit, one of the tracks on the Formula 1 calendar, hosted the fifth round of the World Endurance Championship Super Season, a nine event season that spans two Le Mans 24 Hours races. Jazeman, familiar with the circuit from numerous races during his career, quickly got down to business in the practice sessions posting the quickest laptime in his class in the #37 Jackie Chan DC Racing Oreca 07 LMP2 car in the first two of the three sessions. The team then focused on set up work for the race, posting fourth quickest lap in the final practice session. The qualifying sessions were held in dry weather with Jazeman and Nabil sharing the duties for the grid-setting sessions. Jazeman, as always put in strong lap times and by the end of the session the #37 car was second in class, less than three tenths of a second behind the sister #38 car, to line up 10thon the overall grid. Race day arrived and with it torrential rain for the 35-car field, which was set to be the biggest challenge for the cars and drivers. Jazeman was behind the steering wheel for the start of the race, which began behind the safety car, but after 16 minutes it was red flagged with track conditions too dangerous for racing. Racing resumed and as soon as the green flag flew Jazeman was on the attack, wresting the lead from the #38 car, until the quicker Dragonspeed car overtook and Jazeman settled into second. The race was red-flagged twice in the first 90 minutes with the safety car making plenty of appearances, not only leading the field while conditions were particularly bad, but also being deployed as cars up and down the field spun while the rain intensified. Unfortunately for the #37 car one of these occasions was a spin for Weiron that left him beached in the gravel and set the #37 back a lap. The team kept pushing on, with the rain and conditions claiming a number of victims and frequently changing the running order. As the race drew to a close the #37 car was lying in fifth place, eventually claiming fifth place finish on the track which was elevated to fourth place after the exclusion of a rival car in post-race checks. Jazeman said of the weekend, ‘We had the pace for a strong race this weekend but the weather conditions got the better of us, with rain not favouring us. Considering this, our pre-race preparations were really good and we had a really good set up and well-balanced car. We’re always around and about the front, so to finish off the podium was a bit of a shame, especially as it has dropped us down the championship order. We’re still well in the fight for the title though and it’s a long way to go, including another Le Mans 24, so there’s everything to play for, I’m just hungry for the next race. That’s not until March next year, which seems a long way away! My congratulations go to our sister car drivers, Ho-pin, Gabriel and Stephane, who did a great job today to win on home soil. If we couldn’t win today at least it was another team car on the podium. Jazeman will stay on in China, racing for a second weekend in Shanghai with the opening round of the Asian Le Mans Series.